An incomplete cast copper-alloy fragment originating from a probable Ewart Park socketed gouge of Late Bronze Age date, c. 1000-800 BC. Only the lower edge of the gouge survives, consisting the working end of the object, with almost all of its upper socketed section broken away in old damage. It is circular in section, tapering to form a chisel-like edge with a broadly 'V' shaped deep recess in one side. Casting seams are visible on both sides of the object, though these are now somewhat eroded. Preserved in fair condition with an even greenish patina, it survives to a length of 33.31mm, 12.67mm in diameter at its upper edge and 14.80mm wide at the working edge. It weighs 21.01g. 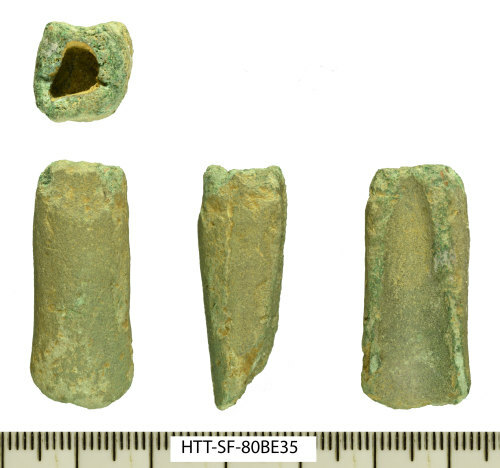 A more complete socketed gouge of probable identical original form is recorded on the PAS database as IOW-7B755D.